The annual Digital News Report, from the Reuters Institute for the Study of Journalism at Oxford University, is a must-read for anyone wanting to understand the attitudes and habits of news audiences. Just over half of digital news consumers in the country (51 percent) use the messaging platform for news consumption in a given week, just behind Facebook (58 percent). 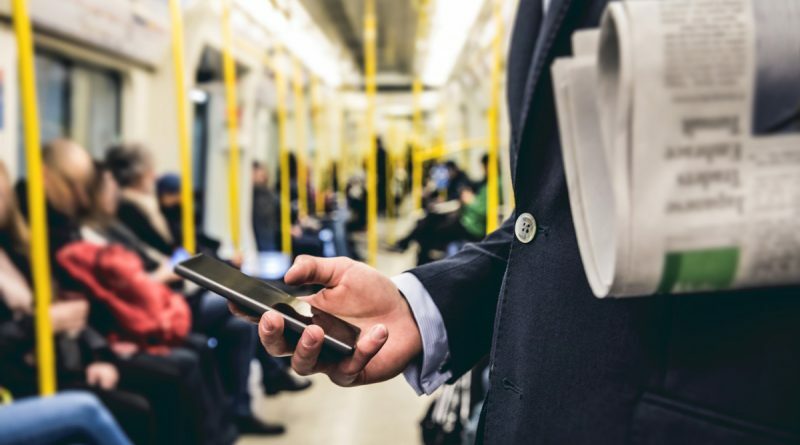 In contrast, only 3 percent of digital news consumers in the United States use the app for this purpose, reflecting the wide regional – and global – variances in usage of this service. In these two nations, just under a quarter (23 percent) indicated that “I think you can trust most news, most of the time.” Conversely, this number leapt to 62 percent in Finland and 60 percent in Brazil. In only six nations were more than half of respondents willing to agree with this statement, reflecting the trust challenges faced by journalists and news organizations worldwide. Interestingly, although South Korean audiences are amongst the least trusting of the news, only a quarter (26 percent) are likely to take a news detox. News avoidance, at 6 percent, is lowest in Japan. Audiences with ongoing subscriptions for digital news services are highest in Norway (15 percent), Sweden (12 percent) and Denmark (10 percent). Other purchases, such as single editions, donations etc. are more common consumer habits across the nations surveyed, reflecting the challenge of converting casual users into more (financially) committed ones. In the U.K., where the BBC plays a pivotal role in providing free news content (albeit one paid for by a near-universal license fee), just 3 percent of respondents paid for an ongoing news subscription in the past year; other forms of payment for news are also lower than in many other nations. Although the Apple News app is only available in the U.S., U.K. and Australia (with the “Spotlight” feature available in many others) the service has nonetheless seen rapid growth in the U.S. and Australia. Amongst American iPhone users, the weekly reach of the service almost doubled (from 13 percent to 25 percent) in 2016, and the service grew from 8 percent of iPhone users in Australia last year to 25 percent by 2017. It will be interesting to see if this momentum continues, both in those markets and in others around the world as the service is further rolled out. Services like Apple News and Snapchat Discover represent the next generation of aggregators. Aimed at a mobile audience, they are seeing discernible growth among their target audiences. Meanwhile, more traditional aggregators continue to be popular in some emerging markets. Google News, for example, enjoys 21 percent weekly penetration in both Asia and Latin America, ahead of North America (13 percent) and the EU (10 percent). Asia leads the way for aggregators as a pathway to digital news. 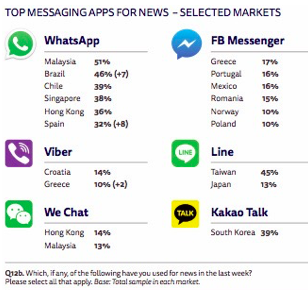 The most popular markets for mobile alerts, as a news gateway, are Taiwan (32 percent of users in a given week), Hong Kong (27 percent) and Turkey (24 percent) with Sweden fourth at 22 percent. 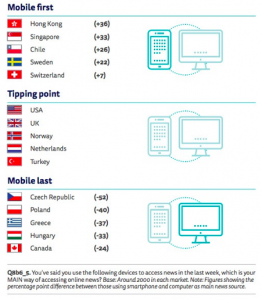 Hong Kong leads the way in terms of audiences being mobile-first for news consumption. 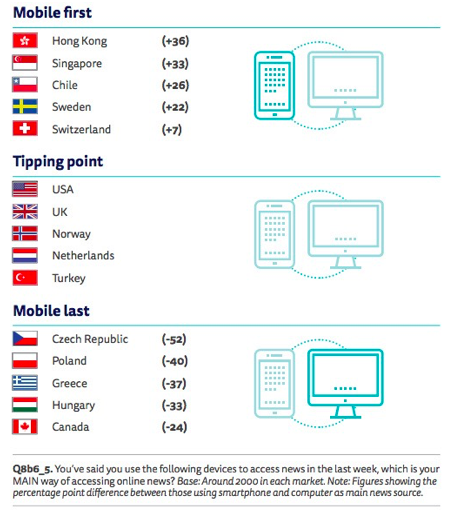 Over a third (36 percent) cite their smartphone as their primary device for accessing news, with Singapore just behind. In Hong Kong, nearly a third (31 percent) say their smartphone is the only device they use to consume the news. Malaysia (27 percent), Singapore (26 percent), Chile (25 percent) and Mexico (24 percent) show similar trends. 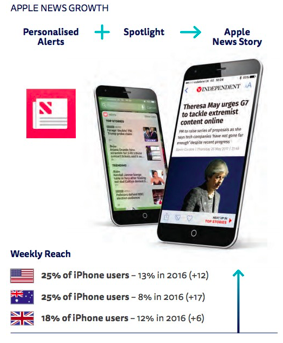 For researchers and companies interested in mobile news behaviors, these markets are the ones to watch. 8. The brand with the biggest global news reach is… Yahoo? Yes, that Yahoo. In a landscape dominated by discussion about Facebook’s suite of services (which include Facebook, FB Messenger, WhatsApp and Instagram), the reinvention of major legacy brands like the BBC, CNN and The New York Times, as well as the emergence of new global players like the Huffington Post, Vice and BuzzFeed, the continued importance of Yahoo may surprise some. Tucked away on page 49 of the report is a chat which shows how the original web portal continues to enjoy huge traction amongst news audiences, including 25 percent of weekly digital news consumers in the US (placing it ahead of other major brands), Japan (53 percent) and Taiwan (48 percent). Even in markets like Brazil, Australia and Germany, it’s the leading international news brand, and second only to the Huffington Post in France. Old media habits, partnerships (especially in Asia), as well as the resilience of its search and email properties, may all help to explain this unexpected finding. What this serves to show is that, however much we think we know about the modern-day news consumer, the Digital News Report always contains a surprise or two. To find out more visit: digitalnewsreport.org. Visualizations courtesy of the Reuters Institute for the Study of Journalism. Main image CC-licensed by Flickr via Robert Schuman Centre for Advanced Studies. This post was originally published for IJNet.